It’s starting to get to that time of year when the seasons click into place. The nights are getting darker quicker and today when I left the house, I noticed there was more of a chill in the air. It’s definitely not summer any more and to be honest part of me is glad. Although I do love the sunshine (and apart from the confusing heatwave last week which was quite nice really), I’m ready for it to be AW now! 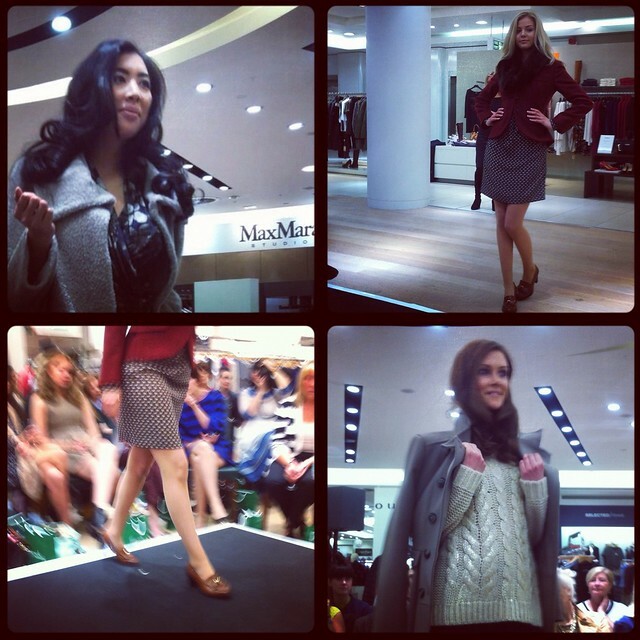 So what better way to look forward to the new season than with a sartorial treat from MaxMara? Now if only I could figure out a way of being able to afford that orange coat.. The show tonight was all about combining textures: from leather panelled dresses to thick knit jumpers worn under masculine tweed coats, Fenwick highlighted the best of the MaxMara ready to wear collection for AW 12 from Max Mara Studio, Mainline Max Mara, Weekend Max Mara and Sportmax Code. I loved the palette of neutrals hues injected with 60s style bright colours like blues and orange. 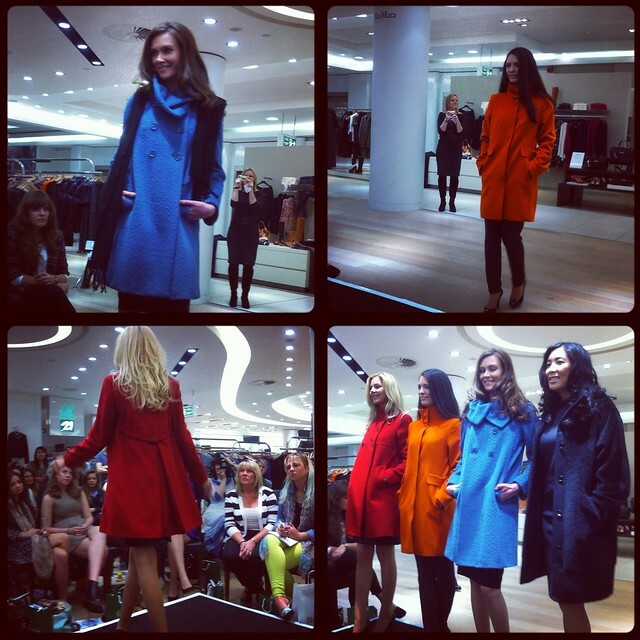 The orange coat that I’m lusting after, in particular, is so Breakfast at Tiffany’s! One of my favourite looks from the evening was the maroon jacket worn over a printed dress and draped with a fur stole- definitely an outfit I’ll be trying to channel when the proper cold weather comes. I’m looking forward to getting out my big coats, fur and leather gloves, and getting all wrapped up. For me though, some of the best parts of the looks tonight were the details: from the elegant handbags (not quick enough to snap them, sorry!) to delicately tied scarves and brown chunky-heeled loafers from Russell and Bromley. A new pair of heeled loafers is definitely on my AW wish list.. What’s on yours? Totally agree that my favourite looks would be the maroon jacket in the second pictrue with the fur over the printed dress and LOVE the orange coat – it is so straight out of Breakfast at Tiffanys! So Audrey! Love the way the red jacket is moving at the back as she's walking, and the thick knit jumper with the tweed is gorgeous! So excited for autumn/winter clothes now! It's so hot but I cannot help but still lust for those coats! I've never been to MaxMara, I mean, I've seen the stores but nothing had ever gotten my attention but I really like coats and since it's almost fall I think I should give them a visit. Pictures are great! Love all the clothing! Great photos, I'm trying to spot anyone I know!